Intro Lesson: We started out the day with some geography talk. The bikers took turns labeling “North”, “East”, “South”, and “West” as well as the boroughs on a map of NYC. We were super anxious to finally get out on the road after a week of orientation. Today, we explored the efficiency and personal factor of a bike. 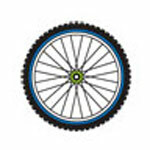 We discussed how biking, like walking, is a personal experience, but it gets you farther than walking could–like a car! The best of both worlds! In fact, if a gallon of gas (which takes a car about 25 miles) was converted into food energy (calories), a biker could go for 1,000 miles! Crazy huh?! 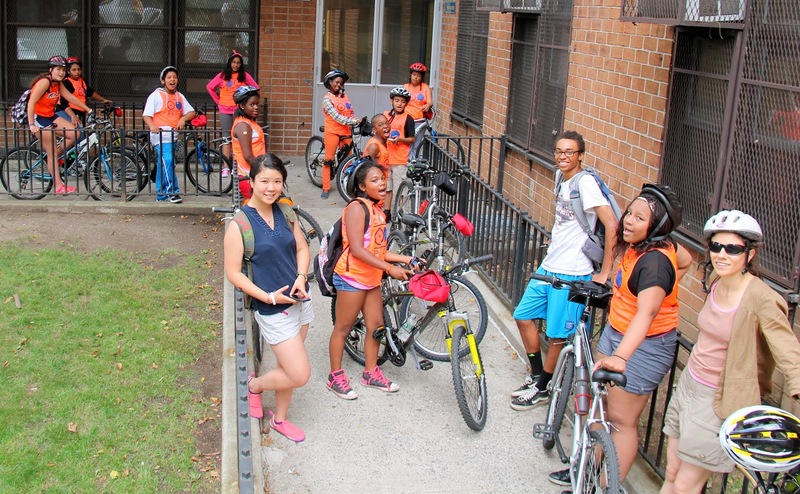 East River: Today marked the first official day of Cyclopedia 2014! Ten Hot Wheelers and five volunteer leaders started with a great first ride! After the lesson, we walked our bikes from MS 114 to the East River Esplanade, and we were on our way! Safely in single-file, we followed our fearless captain, Cappy, north towards the Triborough Bridge. While we were waiting for our group to get together, Dr. Perry Sheffield pointed out the East 91st Marine Transfer Station–a fairer way to get trash out from Manhattan to the dumps. Our first stop was at the CVII Pier. We got our cameras out and started snapping away. Back on our bikes, we made another pit stop to check out our dear friend and mascot, the cormorant. Cappy taught us that the cormorant is a water bird that tends to peep its snakey head out of the water while its swimming. We took another break at the northernmost point of the ride. We drank some water, indulged in some applesauce, Estuardo and Christina played some cards. Re-hydrated and re-energized, we headed south towards the Queensboro Bridge. On our way, one of our leaders, Dr.Sheffield, showed us Gracie Mansion where each current mayor is given the opportunity to live. Jewel even knew that our current mayor, Bill de Blasio, is a former member of the New York City Council. We made a quick stop by a dog park to refill our bottles, but the Hot Wheelers couldn’t wait to get started up the infamous hill! The incline was very steep, but almost everyone powered through and pedaled up the whole way. Congrats! Of course, the speedy ride down the hill was their favorite part! Finally, we biked back uptown and came to the Stanley Isaac Neighborhood Center where the Hot Wheelers uploaded their photos and wrote about their day. Overall, the Hot Wheelers should be extremely proud of themselves! They were determined and never gave up on the ride. Everyone followed safety protocol very well, including the arm signals (left, right, and stop) which can be difficult to remember. We had a great time! Our riders wrote great journal entries this week, be sure to check them out below!